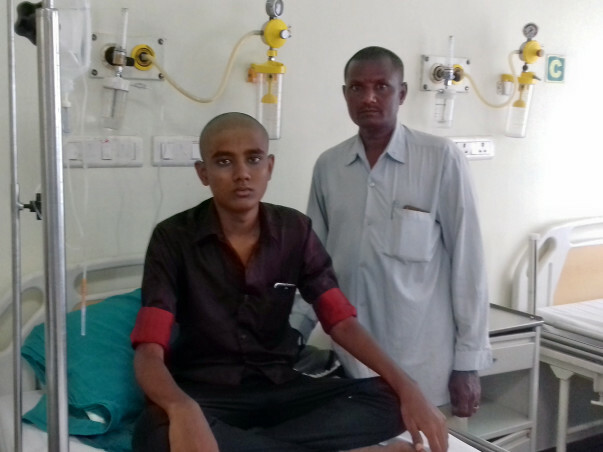 18-year-old Kaviyarasu had been unusually tired and fatigued for months, but he kept it to himself, knowing that his father Paramasivan, a sweeper at a bank would find it very difficult to accommodate a medical expense in his limited salary. “If you meet him once, he will befriend you. The doctors we consulted earlier still call him up to check on him. 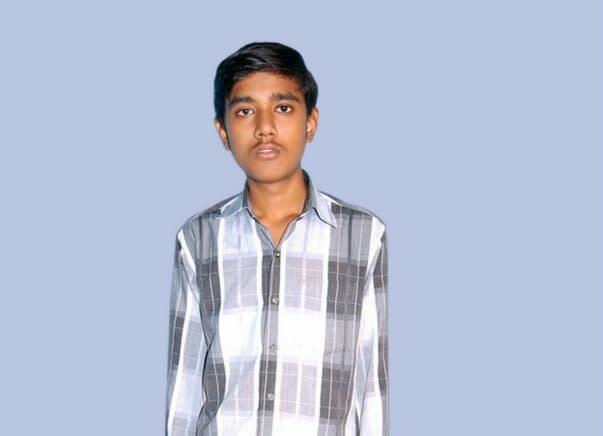 He is also a sincere student and is working hard to become an IAS officer. I have not been able to do much with my life, but he definitely will,” his father proudly says. 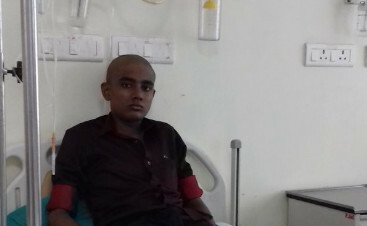 After months of suffering silently, one night Kavi’s headache became severe, it was so extreme that he couldn't move. He was rushed to a doctor. A blood test revealed his Haemoglobin levels were at a scary 2.8. He was immediately admitted to the hospital. Further investigation revealed that Kavi had Aplastic Anaemia: a condition where the body stops producing new blood cells, causing one to feel extremely fatigued and with a higher risk of infections and uncontrolled bleeding. Kavi spent 40 days in the hospital. “My children were very small when their mother passed away, leaving me with nothing but a promise to educate them and ensure they have the lives we had dreamed of for them. Even the thought of going to the hospital intimidates me. The fact that I need to take my son there once in 2 days for a transfusion is both scary and expensive." 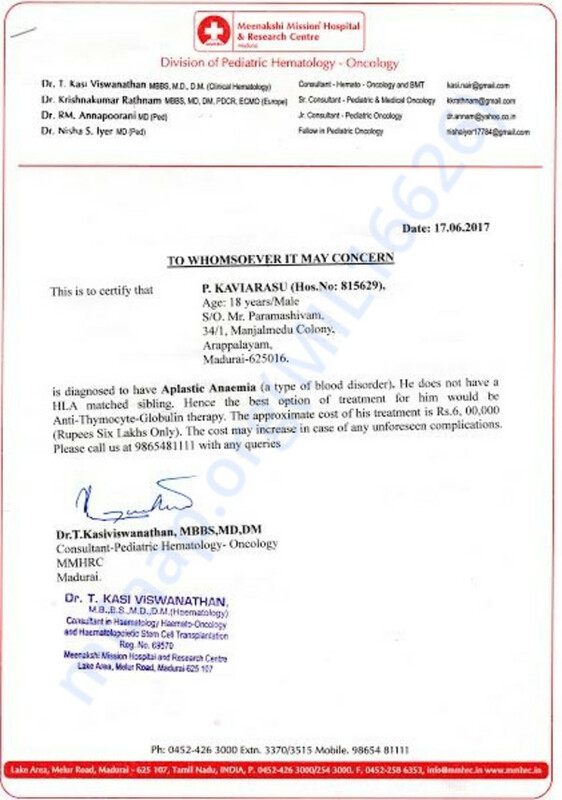 The transfusions cost Paramasivan over Rs. 10,000 a week. This is more than his monthly income. 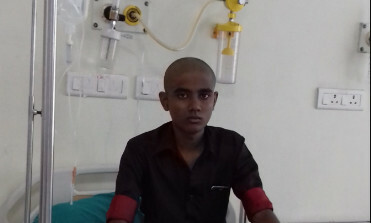 When the doctors first said Kavi must be treated in Chennai, his father was forced to consider quitting his treatment. “I knew I could not even afford the treatment in a new city,” he says. 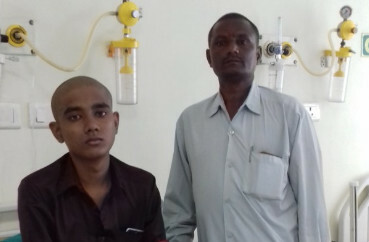 By the time he took his son to Madhurai Mission Hospital, he had almost no money, but with the help of the doctors and his employers he kept the treatment going. Paramasivan took a loan he is struggling to repay. The deductions leave him with only about Rs. 5,000 for the monthly expenses, including Kavi’s treatment. “I am a simple man. My children mean the world to me. It took me years to collect some 48,000 for my daughter’s wedding. Not only did the whole amount get spent over a period of days, but it also did not suffice. 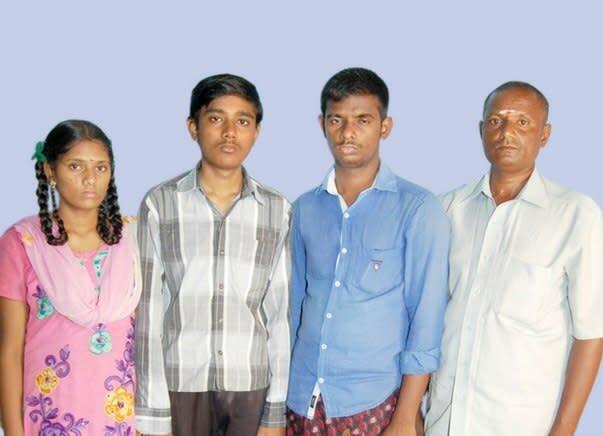 I need to be strong for my son, but I have nobody to share my fears with,” Paramasivan says. Despite his condition Kavi tries to go to college whenever he can. He believes he will recover, and when he does, he wants to become an IAS officer. This bright, promising young boy deserves another chance. 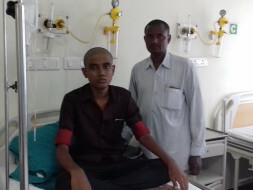 Your contribution can help this father save his son. Keep ur spirits high. U are a future IAS.